Nemo toddler bedding is a fun way to liven up any toddler’s room—and if your toddler is excited about the movie or about fish in general, there’s no better way to make him thrilled. Who can stay grumpy for long when a cheerful orange fish is near? 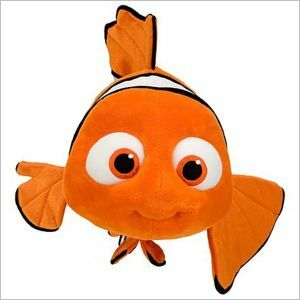 Whether you want nemo bed sheets for your child’s room—or whether you want to do a full Nemo makeover—you have plenty of resources available. Your toddler’s bedroom doesn’t need to be just another bedroom, it can be a magical place just for him; a place that reflects his likes, dislikes, and passions. If your toddler uses a toddler bed you’ll probably want to buy Disney’s Four Piece Nemo and Friends bedding set. This includes a pillowcase, a top sheet, a fitted sheet and a soft comforter. It’s meant to be used in a toddler bed with a crib-sized mattress. This bedding is all made of polyester microfiber, which means it is very very soft. It’s also easily washable; you can just throw it in the machine with your regular nonchlorine washing detergent. The colors are bright and cheery, with the comforter and pillowcase being predominantly a bright ocean blue, and the fitted and flat sheet lighter colored. 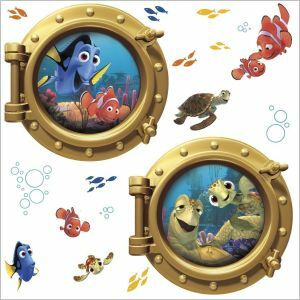 Decorate the walls of your toddler’s room with Nemo Decals. There’s no difficult installation necessary here; just peel and stick it on, as if it was an ordinary sticker. It’ll stick well to any smooth surface, and if you find you don’t like your placement, you can always take them off and try them in another place. If your little guy or girl likes to sleep with a nightlight, you can add a Finding Nemo Color-Changing LED Night Light to the rest of your Finding Nemo bedding and bedroom décor. This night light is energy efficient and cool to the touch, and the long lasting LED light means you won’t be scurrying to find bulb replacements anytime soon..
Add a Disney Nemo Rug on the floor, and your Nemo beddings is pretty much as well complemented as it can be. This one is twenty by thirty inches, and features one very large Nemo blowing bubbles in a bit of blue ocean. It’s a looped rug, which means it’ll be very soft for those little feet as they jump out of the bed. Share the fun of redecorating his room with your toddler—let him help you choose the location for decals and the rug, for instance—or do it all one day when he is out with daddy and let him come back to a transformed room. Either way, he is certain to be ridiculously thrilled, and he won’t be able to wait to go to bed at night.